The most amazing place I've ever been. Well, it's at least one of them. I'm checking this one off my bucket list, although I didn't even know I wanted it on there – until I got there. It was all just part of a days work, co-leading a workshop to Bolivia for Workshops with Purpose. 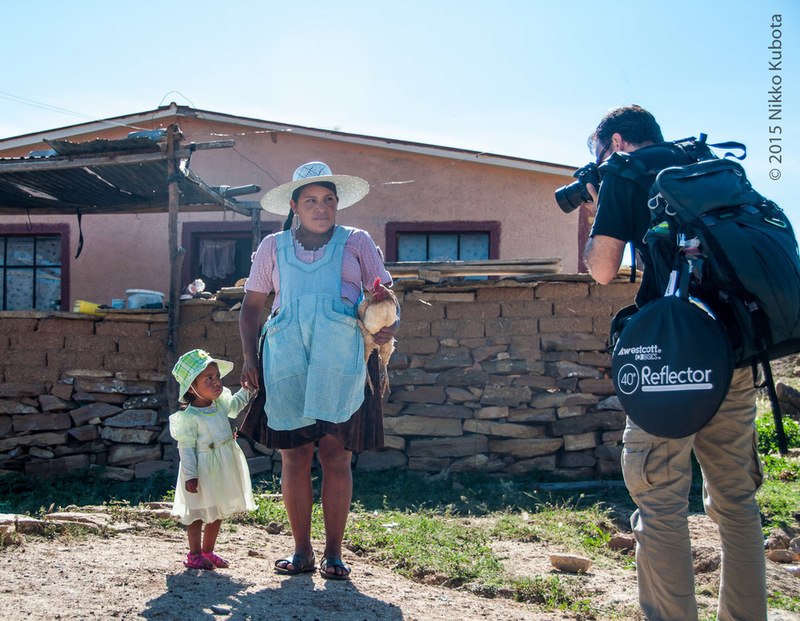 Our project was to take a team of photographers to join with Food for the Hungry (FH) in Bolivia, and give them our time and talents as photographers creating images they can use in promoting their amazing work. We had instruction time, teaching the photographers about working abroad, connecting, workflow, and the intricacies of intimacy with their camera gear. We also spent long days working with FH staff, visiting people in the communities to document the projects and services they provide. It was truly amazing to see their generous hearts and success of their efforts. We just needed to help them share it. We headed up a few days before the workshop started, to do a little exploring at a place we'd heard amazing things about – the salt flats of Uyuni, about an hour flight from La Paz. My 13 yr. old son, Nikko, came with me on this trip. 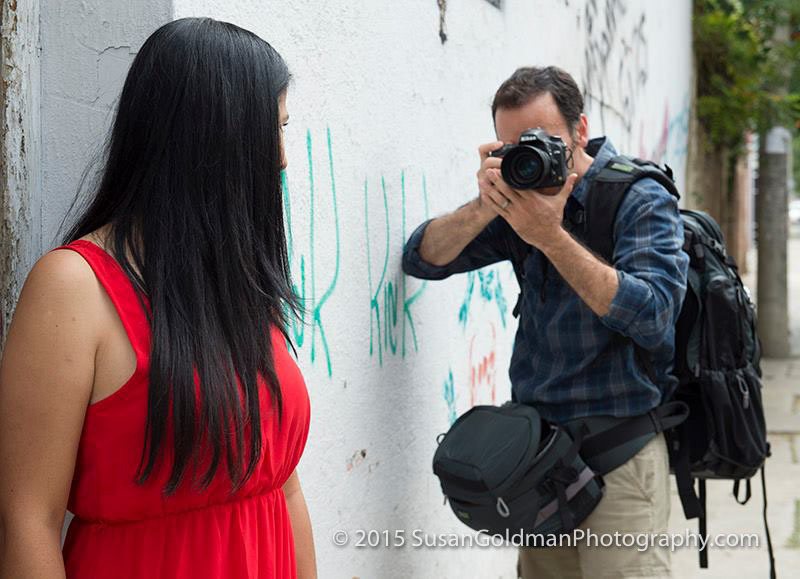 When I told him I was doing a workshop in Bolivia to help and teach photographers how to give back with photography, he said, "I want to go!" How does a father refuse that!? My good buddy, Benjamin Edwards, who was one of the co-leaders on the workshop also came and brought his 11 yr. old son. Two other photographer friends of ours from past workshops decided to join us as well. Our adventure was in motion. The salt flats are amazing. It's one of those places that photos will never quite do justice. You have to stand there, feel the intense sun and struggle to breath in the crisp air – unadulterated and close to the heavens at 12,000 ft. high. You have to stand there and be small, in the vastness of 4000 sq. miles of glistening white salt crystals. You have to be there at night, so close to the millions of stars you've never seen before – feeling as though you could reach out and touch them, their reflections surrounding you like you're floating through space. You have to hear the amazing peace and quiet where the loudest sound is your own heart, beating in your ears, working harder to deliver every breath. You just have to go there. 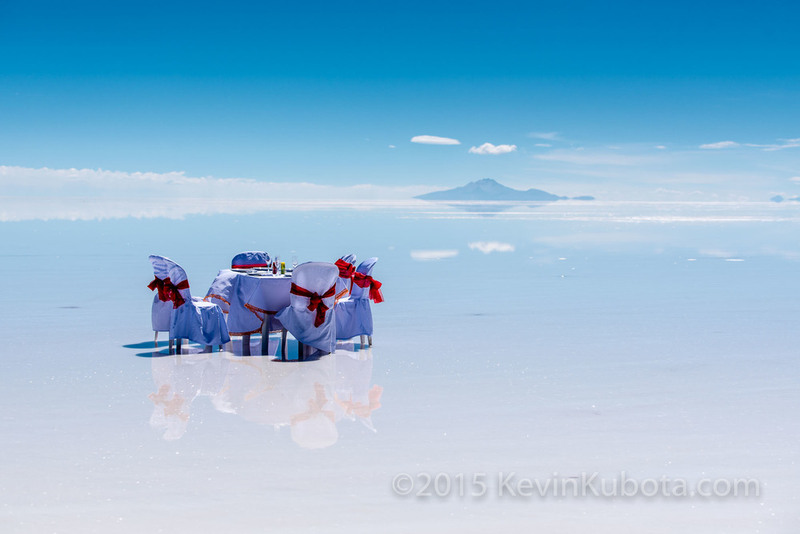 Normally this time of year is the dry season up at Uyuni. Many people prefer to come during the fall, when the rains create the thin layer of water and reflections that are so dramatic and amazing. As luck would have it, they had a very unusual rain storm just 2 days before we arrived, leaving us with incredible reflection pools, puffy clouds, and azure skies. Our guides picked us up at the airport, and after some introductions they said, "We're going to take you to lunch at the most beautiful restaurant in the world!" We knew what they meant. Eating a sandwich from the tailgate of a pickup while enjoying the salt flats would absolutely be the perfect picnic to me. Little did we know, or expect, the incredible experience they had planned for us. After a long dirt road, 4 wheeling through mud, then driving out in to vast, smooth salt flats, we parked at a beautiful spot and they said they would get lunch ready. We were so overwhelmed taking photos and gawking at our surroundings that we didn't realize at first they were setting up something quite fantastic. Out came the white table cloth, red ribbons, wine glasses, silverware, dishes of hot chicken Milanese, rice, fresh vegetables, salads, wine, sparkling water...oh, wow. 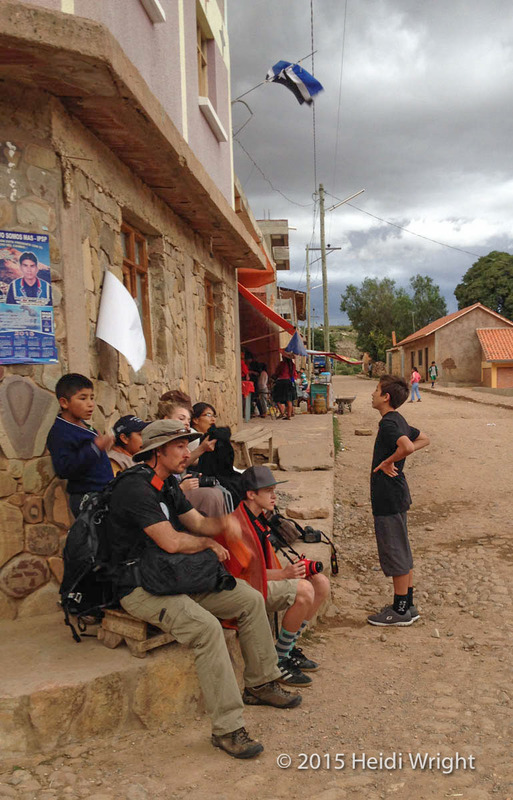 Our 2 days in Uyuni went by like minutes, then we flew back to La Paz to meet up with the rest of our workshop attendees, flying in from all corners of the U.S. The La Paz airport is located at over 13,000 ft. elevation, so the first thing you notice when you get off the plane is your head pounding. Fortunately, none of our team experienced extreme altitude sickness. Fatigue, yes, but no whiners. Just a team of big-hearted photographers, ready to get busy and photograph. It took us another 2 days to make our way out to Torotoro, a small town amidst an incredible national park. Driving out there, on a dusty cobblestone & dirt road, felt as though we were entering Jurassic park. Fittingly, Torotoro is home to fossilized dinosaur footprints, and huge caves, from the age of prehistoric beasts. The intense beauty of the drive again made 6 hours feel like minutes, as we marveled at the epic landscapes unfolding around every turn in the road. We spent the next 2-1/2 days working in Torotoro, visiting and photographing locals, sponsored or supported by Food for the Hungry programs. It was amazing to see how much FH has contributed to the growth of the community – encouraging self-sustenance and education on nutrition. Malnutrition is a huge problem there, especially among very young children. We documented as much as we could, hopefully providing them with images they could use to promote their cause and bring awareness to the need in the area. Our hearts and media cards runneth over. This was the perfect trip to test and refine some of my travel gear. We had to pack as light as possible, while still carrying a professional level of photo equipment. 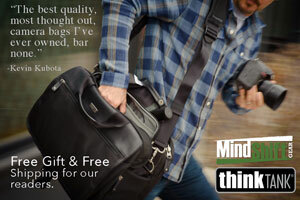 My main camera bag was my MindShift Rotation 180 Pro. This a fantastic bag that I briefly reviewed when I first got it. Now that I've had a chance to take it with me on an Africa safari, and through Bolivia, I have a much better idea of how it functions in the field and holds up. I'm a fan! First and foremost, this pack is comfortable to carry all-day, full of gear. It fits great, is highly adjustable, and is well balanced. Rotating the main camera section to the front is a quick and simple affair, making your essential lenses and gear readily accessible without having to remove the pack itself. I attached an accessory bag to the belt to hold my 70-200mm and everything I needed was right at hand. The top section of the bag has a removable padded lens insert, for even more photo gear. However, I would usually remove this top section and use the large compartment for my daily essentials – warm jacket, snacks, first-aid, extra water, etc. There are outer pockets, perfect for my rain jacket, water bottle, and sunscreen. There is a place for everything, and everything fits perfectly in its place. Carrying a camera shoulder bag while walking for miles a day is miserable. I would never intentionally do that. A backpack is the only way to go, in my opinion, but other backpacks I've owned also require you to dismount it to get at your gear. While this is still better than lugging a shoulder bag, you have to be intentional about stopping and digging out a lens and I'd often find myself not pulling out the ideal lens because it would take too long or be too much trouble. With the Rotation 180, there are no excuses, and I like that. In this way, I actually believe this pack can make you a better photographer. Our liaison from FH, Abi, volunteered to model for us one afternoon for a lesson on location lighting. The bottom of the Rotation 180 pack swings easily from out of the pack to the front, for easy access to lenses and other goodies, like lip balm. 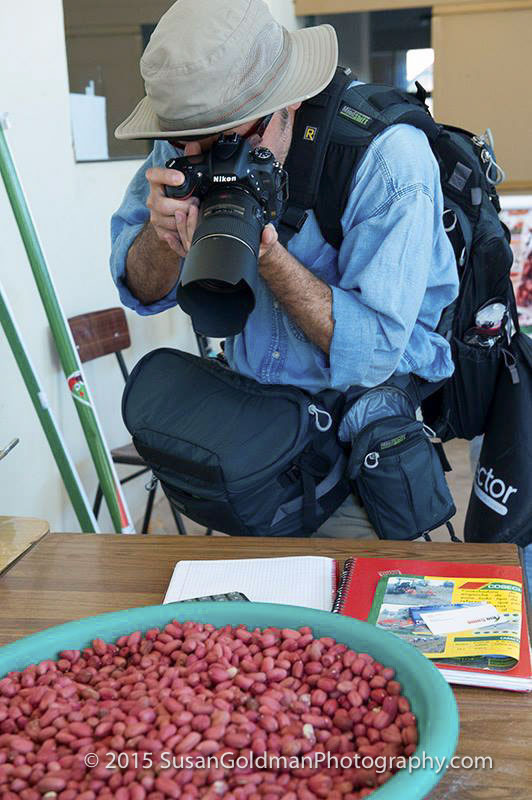 When photographing peanuts, you have to be on your A-game. FH helping the local community start a peanut factory, providing jobs and income. We visited the locals to tell stories of how they have been assisted by FH. We spent the entire day walking from home to home, usually in remote places. The pack carried everything I needed comfortably. At the end of the day, we sat with some locals, waiting for the thunder and lightning storm to arrive that evening. At the end of one particularly long day, we sat and watched a storm brewing. Fortunately, the Rotation 180, as with nearly all MindShift and ThinkTank gear, has a dedicated rain cover which deployed just in time to protect my gear from the rains as we walked back to our hostel. As we hid under the awnings and cheered at the amazing thunder and lightning show above us, we had no idea that the ensuing storm would also bring hail the size of gum-balls that would soon destroy all the crops of the local farmers. The next day was a sad day – to again walk the villages and see the devastation to the crops. Our 10 days in Bolivia flew by. It seems like just a dream now. To have shared this experience with my son is one of the most special memories of my life. To have shared it with my best friends and new friends from the workshop makes it even better. I hope the images inspire you to get out there, see the world, and use your photography to change it for the better. Every little bit makes a difference. Maybe in the process you'll inspire a young person to want to change the world too, and that really is a gift with un-imaginable value. If you'd like to be considered for participation in our next Workshops with Purpose, drop us a note from our facebook page. Who knows where the adventure will take you!